I hope you are having a good week and staying cool. It is very hot in the deep south right now! I am enjoying indoor time with air conditioning and fans. 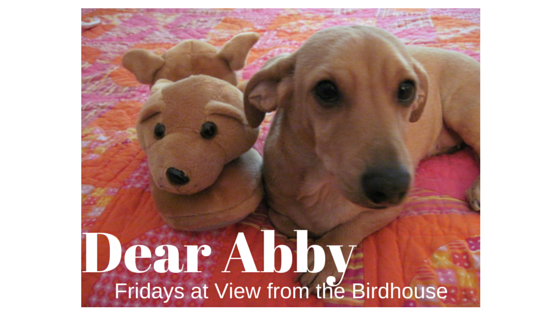 I have a guest post from two special friends today. Cadbury and Woodbury are two beautiful bunny rabbits, and they wrote this interview a couple of months ago. You met their kitty sister, Scotty, here before. I have had this interview scheduled. 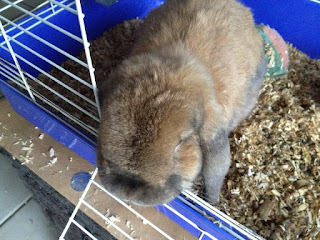 I was so sad to hear that Cadbury passed away in late May. With permission of Cadbury and Woodbury's mother, Beth, I am running this interview in special memory of Cadbury. Cadbury: Hello, Abby! I'm a girl rabbit, and I don't know how old I am. I don't remember much about before, and I know I lived with humans a long time ago, but about five or six years ago, I was suddenly outside all by myself. At first it was fun to run around all over the grass, but then it got scary and lonely and hard to find good food. Cadbury: I heard Mother say, "What's one more bunny in the house?" Cadbury: It wasn't too bad when I got to the new people's house. They put my little hutch on a big wooden table right where everyone would walk by and talk to me. One thing made me nervous - these strange creatures (I learned they're cats) would sit on the table and just stare at me. I didn't care for it. However, I tried stamping my back feet, and it was great! When I did that, they all jumped about a foot in the air and ran away. Ha ha! Now, sometimes I'll sneak out of my cage at night to explore the house (Mother frowns on this). The cats watch me from a distance. They're afraid of my feet! Woodbury: Everything was pretty nice when I got here. Especially because Mom and Dad knew to give me lots of carrots and parsley! Mom says I'm "mellow" which I'm pretty sure means "handsome." Cadbury: At first, Mother would take me to church for Easter, and to the church booth at a local Scottish festival, too. I got tired of the limelight, though, and started to get nervous around lots of kids and big people. Luckily, Woodbury came along at the right time to do public appearances. He doesn't seem to mind. Cadbury: I like when Dad holds me on his lap. I like secretly exploring, and I love little soft toys to play with and sleep on. My favorite thing to eat is this cranberry cookie treat that our human friend Tom brings us. Woodbury: Would it surprise you, Abby, to learn that I love carrots? I also enjoy a big wooden toy that's fun to chew - and it is great to throw against my dish to alert Mom that I feel hungry! Cadbury and Woodbury: Our advice is - don't put bunnies in Easter baskets! All bunnies need lots of love and care, because we don't get along so great on our own. We may not look like it in our photos, but we're both pretty small, so we need some protection and help. All rabbits, no matter what size, should be chosen to be a part of the family for always - not just a holiday! Dear friends, if you would like to leave a comment, I would love to hear from you! Thank you for visiting today. How cute are those little bunnies? This post is so unbelievably cute!! I really enjoyed it, I used to have a pet rabbit myself, so it brought back a lot of warm memories! Thanks friends! I appreciate you stopping by. My Momma loves rabbits, and I like them too. I love this! 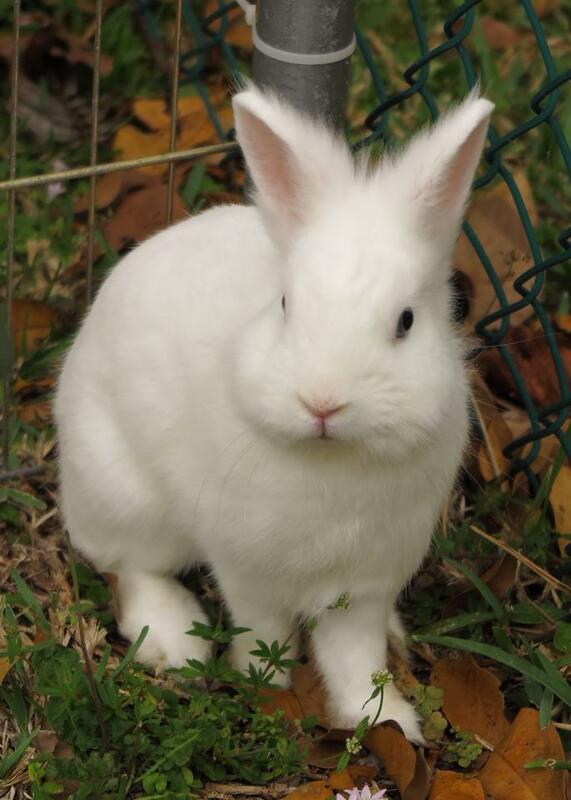 I used to have bunnies and they were wonderful pets. Cadbury and Woodbury are adorable! So sorry to hear that Cadbury passed away. Such a fun post. Those furbabies are so cute! So cute! My MIL had a bunny, they are a lot of fun.